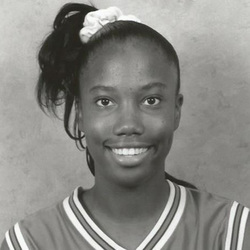 Kym “Hollywood” Hope came to Coral Gables as one of the most highly sought after local recruits, having been named 1995 First Team All-State and the Player of the Year by both the Miami Herald and the Fort Lauderdale Sun Sentinel at Hollywood's McArthur High School. She was the Lady Mustangs’ MVP for three consecutive seasons and in her senior year averaged 17.4 points, 21 rebounds and 8 blocked shots per game. Needless to say, UMSHoF member and Miami Head Coach Ferne Labati was happy to see her arrive on the UM campus. After playing sparingly her first season, Kym showed what talent she possessed by averaging 12 points and 8 rebounds and being named the Big East Most Improved Player for 1996. In her junior year of 1997, she co-captained the team with UMSHoF member Octavia Blue and led the conference in rebounding and double-doubles, was second in field goal percentage and third in scoring. She was named an All-Big East First Team selection and led the Canes in blocks, steals, rebounding and field goal percentage as Miami advanced to the NCAA tournament. As a senior in 1999, she averaged 17.2 points, 8.7 rebounds, 2.1 blocks, 1.9 steals and 1.8 assists per game while shooting 53% from the field and 81% from the free throw line. Hope again made All-Big East First Team honors and led the conference for the second year in rebounding. Once again, the Lady Canes saw post-season action in the Women's NIT tournament. Kym finished her career in the Top Ten in school history in scoring (6th, 1,462 points) rebounds (3rd, 888), field goal percentage (2nd, .526) blocked shots (2nd, 164), free throw percentage (5th, .741), free throws made (8th, 546), free throw attempts (10th, 1,039) and games played (7th, 113). After graduating from UM with a B.A. in Sociology, Hope played in the WNBA for the Orlando Miracle (1999), Utah Starzz (2000), the San Antonio Silver Starzz (2003), as well as playing internationally in Spain (2000), Korea (2001) and Greece (2002). She got her coaching start as an assistant under UMSHoF member Robin Harmony at St. Thomas University in 2009, the same year she was named an ACC Legend by the Atlantic Coast Conference. Kym has partnered with other UM alumni to establish “The Hopes and Dreamers Foundation”, a non-profit organization for under privileged youth in the inner city promoting education, health and wellness.